The term “Rifle” means a weapon designed or redesigned, made or remade, and intended to be fired from the shoulder and designed or redesigned and made or remade to use the energy of the explosive in a fixed metallic cartridge to fire only a single projectile through a rifled bore for each single pull of the trigger. 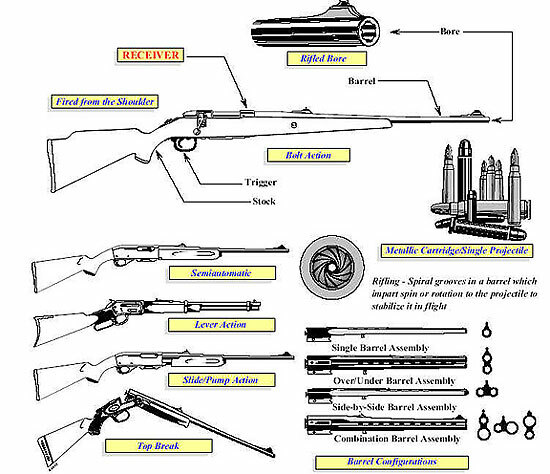 Note: This illustration shows the primary characteristics exhibited in the rifle category. Since rifle configurations differ significantly, various models in this classification may exhibit any of the illustrated components in a revised configuration but not necessarily all components shown will be incorporated in any one given design.